Palisades backcountry wolves chase sheep. Sheep fall on top of each other. 176 suffocate. Updated 8/23 Looking back. Was 2009 “massacre” of sheep really just another frightened sheep wreck? With in incredible 1714 people assigned to fighting the Beaver Creek fire which has slowly grown to 108,000 acres, good progress has been made securing its long east flank, greatly reducing the threat to burning these towns. The fire is rated at 30% contained. Matt Leidecker Photography has a stunning gallery of Beaver Creek fire photos. The weather is the most important factor, despite the huge effort because strong winds can overpower all firebreaks and back burns that have been made to hurl embers as much as a mile onto rooftops and unburned hillsides. On the other hand, cooler temperatures and rain without significant lightning can put an end to the event. Today an upper low pressure that has been stuck in place for a week off the California coast is moving inland. This change is likely to increase the storm potential in central (and other Idaho places) for good or ill. If the weather remains and dry and hot the fire will probably continue to burn in the backcountry in all directions except to the east and perhaps the south, maybe through September. Meanwhile attention is focusing on a new fire burning in and outside the west flank of the Sawtooth Wilderness. 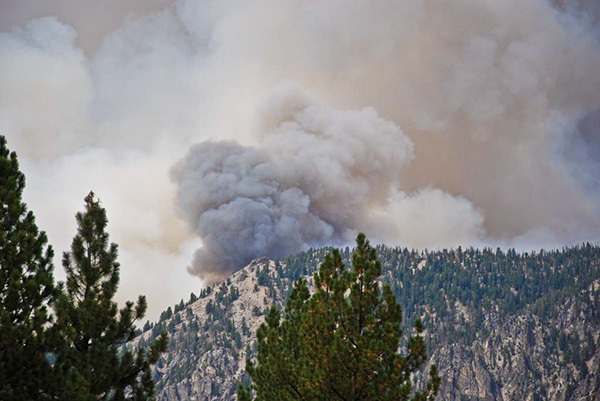 The Little Queens Fire, now at over 10,000 acres is burning in very rough country about three miles northwest of the tiny backcountry town of Atlanta, Idaho, a place that has been threatened by wildfires time after time in recent years. Atlanta is evacuated. The fire is burning to the north, west, and especially southeast along two very rugged and very scenic ridges, studded with glacier created lakes. Here is a photo from Google Earth of the area the fire is burning. Parts of the Sawtooth Wilderness and surrounding area (almost all backcountry with no real roads) are closed to entry. The fire has now reached China Basin on the south, off of the ridges. Part of that area burned in recent years. Within 20-50 years the Sawtooth’s will look very different because of climate change. Very few trees, much like what is known as a modified chaparal. The long range weather forecast for the Northern Rockies is warmer and drier than normal for September.